Benefits for both the Taxpayer and the Sierra Vista VICaP! This statute allows individual taxpayers to receive a $400 dollar-for-dollar tax credit on their Arizona income tax when they make a cash donation to a qualifying agency ($800 for married filing jointly) Sierra Vista VICaP is a qualifying agency! What is a qualifying charitable organization? A qualifying charitable organization is a charitable organization that is exempt from federal income taxes under section 501(c)(3). What kind of services must the qualifying charitable organization provide? Services means cash assistance, medical care, child care, food, clothing, shelter or any other assistance that is reasonably necessary to meet immediate basic needs and that is provided and used in Arizona. Must a qualifying charitable organization be certified? 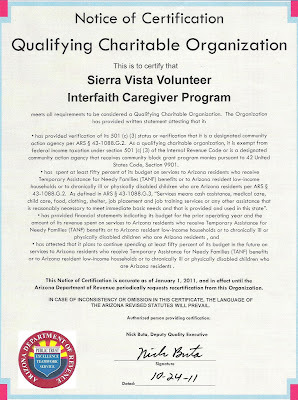 Yes, the qualifying charitable agency has applied and been certified by the Arizona Department of Revenue. Is there a list of qualifying charitable organizations? Must a taxpayer itemize deductions in order to qualify for the credit? Yes. A taxpayer must itemize deductions and deduct charitable contributions on the Arizona State income tax return. Can a taxpayer participate in the Arizona Charitable Tax Credit ARS 43-1088 and the Arizona School Tax Credit ARS 43-1089.01? Yes! The taxpayer can deduct the donations made to the Sierra Vista VICaP, and Arizona Public School and an Arizona Private School. When can I make the donation to the Sierra Vista VICaP? To receive the tax credit, the payment can be made during the current tax year (January-December) or up until April of the following year. Satisfaction from knowing that your donation has helped to prolong the time that elderly, disabled, and home-bound adults can be contributing, productive members of our community. Also, within thirty days of the donation a receipt will be mailed to the donor for tax purposes.